This is a great article from the Oregonian regarding dental procedures and the reason for performing them under anesthesia versus without anesthesia. It’s an informative read that is relevant to many pet owners, so check it out below or by clicking here. In honor of National Pet Dental Health Month, the Oregon Veterinary Medical Association reminds us that anesthesia-free dentals offer little to no actual health benefits. While it may be scary to think about putting your pet under anesthesia, consider that not doing so can sometimes be even more harmful. It’s simply not possible to conduct a comprehensive oral exam and cleaning without sedation, according to veterinary professionals. That’s because dogs, cats and other animals just won’t sit still with their mouth open for the length of time it takes to do a thorough exam and cleaning. If a pet has any kind of periodontal disease, the exam can be uncomfortable if not downright painful, so it’s unlikely that the animal will remain stationary while enduring all that poking and prodding. Veterinary professionals use an ultrasonic scaler to clean the teeth and under the gum line effectively, then flush away infection-causing debris with water. Anesthesia will ensure that your pet remains still during these procedures, which will keep your pet comfortable and protect the veterinary staff from any potential bites. Instead of the ultrasonic scaler, non-veterinary providers use a hand scaler, which can scar and pit tooth enamel or tear soft gum tissue if the tool slips or the animal moves (which it likely will, if it’s not under sedation). What’s more, sedation is the only way to allow veterinary professionals to clean properly under the gum line – no matter what kind of equipment is used. While the part of the tooth that you can see may look clean after a non-anesthetic procedure, it doesn’t remove the plaque and tartar that the ultrasonic scaler wipes away. Simply removing visible tartar “does not clean your pet’s teeth and leaves your pet at risk for a progression of the remaining oral disease and future dental disease and problems,” according to the American Veterinary Dental College. The bacteria in plaque can build up and creep under the gum line, leading to periodontal disease. Worse, infections that develop can enter the bloodstream and cause potentially life-threatening conditions that can damage vital organs. And while they may be cheaper to begin with, the cost of dental disease as a result of anesthesia-free cleanings can become much more expensive in the long run. 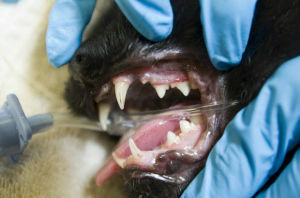 The organization recommends annual veterinary dental cleanings by a licensed veterinarian under anesthesia after age 2. Unlicensed providers, on the other hand, have no education requirements, regulations and may not carry liability insurance, the OVMA says. To learn more about the importance of regular dental cleanings or to find a veterinarian, visit the OVMA website.